Yucatán has captured my heart. I think Yucatán and I think of pedaling down dirt roads past every shade of green. I think of colorful jarana dancers and the absolute best tacos a person could ever eat. I think of Cacalchén, a town rich in Mayan culture and history where everyone calls me "Catalina." I think of the Nathaniel Academy and my piano students who are so eager to learn music. I think of a love that is crazy and fierce and unrelenting. These churros are dedicated to some of the people I love most down in Yucatán, because I"m missing them a little extra this week. 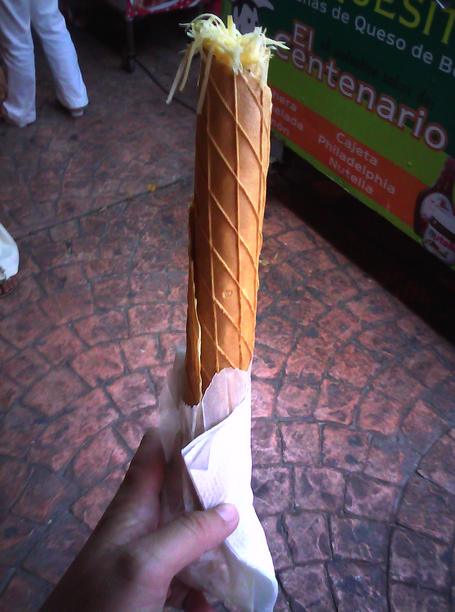 Oh, what I would give to be able to teleport to centro and pick up some churros and marquesitas from the street vendor. Because that didn't seem too likely to happen in the near future, I decided to attempt both recipes on my own this weekend! Twas a tumultuous creative journey, to say the least. Let's start with the marquesitas. First, I couldn't remember what they were called and spent thirty minutes googling "mexican snack thing with the rolled up cracker and lots of cheese" to no avail. Finally I gave up and messaged my friend Carla in Mexico, who kindly enlightened me (gracias, Carla). Turns out the process requires a marquesita iron, which I do not own (does anybody in America own a marquesita iron?? ), but that did not deter me. Instead, I put the batter on a frying pan and squished it with the bottom of a round cake pan, which almost worked until things started burning and the smoke detector went off. Luckily, any vague semblance of a cracker stuffed with cheese is bound to taste good. I give my attempt a generous 3/10. The churro part is where things get fiery. No, literally. I woke up early this morning to make these and had the kitchen all to myself. Feeling smooth and in control, I set the pot of oil on the stove and lined a plate with paper towels (warning!!) for draining the churros. I turned around for a moment to get something, and when I turned back around EVERYTHING WAS ON FIRE. Clearly I have never dealt with a kitchen fire before because I panicked and my first instinct was to frantically start blowing on it. When I realized that blowing out a fire is not really the same as blowing out birthday candles, I ran to the sink and started dumping bowls of water all over the stove, all the while envisioning our house burning down and internally crying, "I just wanted some churros, that's all I wanted!!!" Meanwhile, my family sleeps calmly upstairs. The fire alarm goes off (again). My dad wakes up and turns it off without even coming down to see what's happening. He resumes sleeping. I put out the fire and clean up the miniature ocean on our kitchen floor. Peace is restored. FIRE SAFETY, FOLKS, that's all I have to say. Also, my mom has no idea this is what happened as she was sleeping and is probably finding out at this very moment as she reads this post. Mom, I am so sorry. All of that is to tell you: do not let my mishaps and stupidity discourage you from making this recipe! Nothing beats an authentic Mexican churro, but I will venture that these come pretty close. They transported me back to the churro stand, right to the moment when the vendor hands you those crisp, sugar-coated rods and that first bite fills your mouth with hot steam. I melted some chocolate and warmed a can of dulce de leche for dipping and it was wonderful. 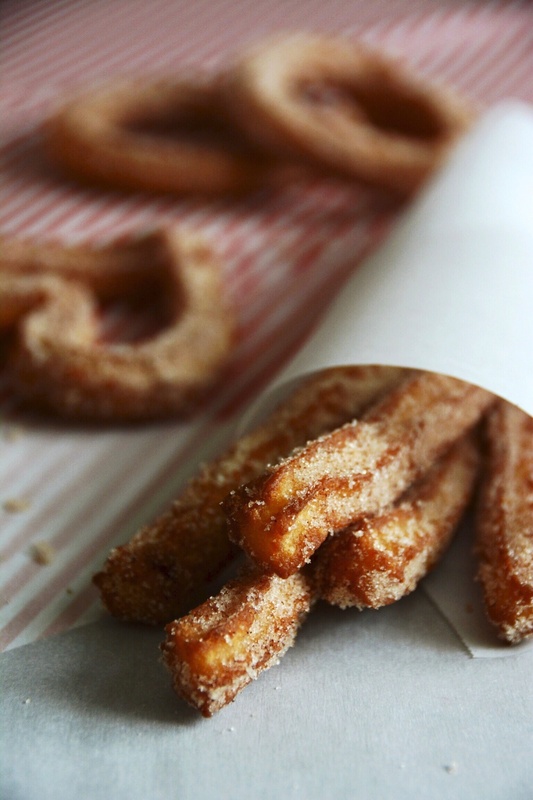 Feel free to experiment with churros of all shapes and sizes! The more the merrier! And to my friends in Yucatán, les quiero mucho. If you would like to learn more about the Nathaniel Academy in Cacalchén, follow this link! Note: I made these mini by using a Wilton 1M tip and cutting them at around 4 inches. This made about 22 churros. Stir water, white sugar, salt, and vegetable oil in a small saucepan and put on the stove over medium heat. Bring to a boil and remove from heat. Add in the flour and mix together with a folk until it forms a cohesive dough. Pour 1 and 3/4 inch of oil into a large skillet or saucepan and heat to 375 degrees F (190 C). While waiting for the oil to heat up, line a baking sheet with parchment paper. Fill a pastry bag with dough and pipe strips onto the baking sheet. Use a pair of kitchen scissors to cut off the strips at around 4-6 inches, depending on how long you want your churros to be. Try piping them into different shapes and sizes! When the oil has heated up, drop in churros 4 or 5 at a time. Be sure to keep an eye on the temperature, keeping it as close to 375 as possible. Fry until golden, around 1-2 minutes. Remove from the oil and set on paper towels to drain. Dip in chocolate sauce or dulce de leche and enjoy! Best when eaten immediately.